I first made these a few years ago and they were a breakfast hit. Michael thought that they were perfect and didn’t need a single change to the recipe. The boys devoured them and my oldest asks for pumpkin muffins every day now. 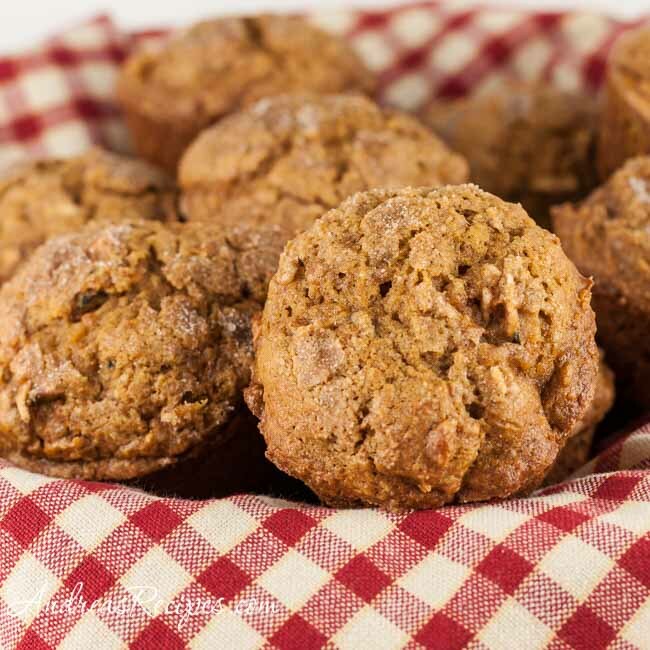 The combination of the pumpkin and apple makes a perfect fall breakfast or snack, and they are easy to make. I originally made these with unbleached all-purpose flour and now I use part all-purpose and part whole wheat pastry flour as a way to make them healthier. Preheat oven to 350° F/175° C.
Whisk together the flour, baking soda, baking powder, salt, and spice in a the 3 quart mixing bowl; make a well in center of mixture. In the bowl of the stand mixer using the paddle attachment, mix sugar, pumpkin, melted butter, and eggs on low speed. Pour the mixture into the dry ingredients, stirring with a spatula just until moistened, about 15 turns. Fold in chopped apple and scoop into greased muffin pan, filling each cup about 2/3 full. In the small bowl, whisk together the topping ingredients and sprinkle evenly over the batter. Bake in the preheated oven for about 20 minutes, until the muffins are golden brown. Remove from pans immediately, and cool on wire racks for a few minutes before serving. Flour: Use 1 cup unbleached all-purpose + 2/3 cup whole wheat pastry flour.